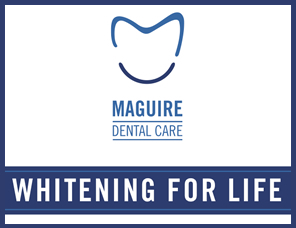 Maguire Dental Care Whitening for Life Programme has been developed for our patients who take their dental upkeep seriously and also as an incentive for those who need a little help in maintaining their dental health. Research shows that patients who follow recommended hygiene advice and complete necessary dental treatments are more likely to maintain a healthy dental routine. 1. In order to participate in the Whitening for Life Programme you will first need to consult with Dr. Michael Maguire / Dr. Ronan O Leary to see if you qualify as a whitening candidate. 3. At every 6 months, you must book an appointment with one of our hygienists Susan / Katie and you will receive a refill of whitening solution absolutely FREE. 1. You must attend the hygienist every 6 months for your cleaning appointment or you will be disqualified from the programme. You must also book yearly examination appointments with Dr. Maguire / Dr. O Leary. 2. Lost or destroyed trays will be replaced at a cost of €40 per tray to the patient. 3. One whitening gel syringe will be rewarded at each cleaning appointment. 4. Attend treatment on any decayed or broken teeth.